When candy makers at Jelly Belly Candy Company set out to create the world's first beer flavored jelly bean, the question wasn't how; it was what. Ale or Lager? Stout? Lambic? Pilsner? In the end, the company opted to pay homage to its German ancestry with a Hefeweizen-inspired ale flavor, and Draft Beer Jelly Belly®jelly beans took shape. The new flavor will debut at Winter Fancy Food Show in San Francisco and ISM in Cologne, Germany. Beer has been a highly-requested flavor by consumers for decades. Jelly Belly is known as much for flavor innovation as perfection. The research and development team wanted to get it just right before announcing the new flavor to the world. "This took about three years to perfect," says Ambrose Lee, research and development manager for Jelly Belly Candy Company. "The recipe includes top secret ingredients, but I can tell you it contains no alcohol." The effervescent and crisp flavor is packed in a golden jelly bean with an iridescent finish. Beer connoisseurs will find the flavor profile to be clean with notes of wheat and a touch of sweetness. The aroma is mildly bready. While Draft Beer packs a flavor punch, it is alcohol free. "Usually the factory has a sweet and fruity aroma, but when we're making this flavor it's just like being in an ale house," saysJeff Brown, vice president in charge of manufacturing for Jelly Belly Candy Company. 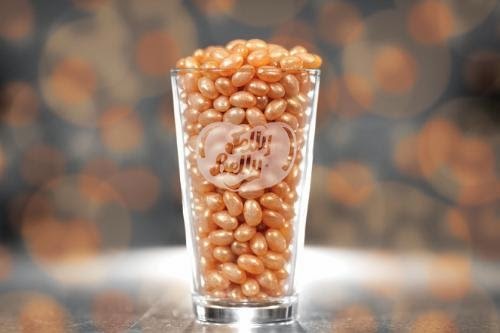 "Anyone who enjoys a good, cold beer will enjoy Draft Beer Jelly Belly beans for the simple fact that it tastes just as you'd imagine," says Rob Swaigen, vice president of marketing for Jelly Belly Candy Company. "I love the flavors in a good beer and Jelly Belly has managed to get that from brew to bean in an incredible way," says Jackie Dodd, beer expert, cookbook author, and the voice behind the popular cooking with craft beer blog The Beeroness. "Jelly Belly found a way to fit 15 pints in the palm of your hand, they deserve an award." Draft Beer Jelly Belly beans are a wonderful gift for beer lovers for Father's Day, birthdays, and even St. Patrick's Day andOktoberfest . The new flavor will be available at candy counters throughout the world in early 2014. Draft Beer is the latest in a long line of flavor innovations from Jelly Belly Candy Company. The company first created a non-alcoholic gourmet flavor in 1977 with Mai Tai. Since then, more flavors from Blackberry Brandy to Strawberry Daiquiri were developed, inspired by popular cocktails. Over the years, favorite flavors like Piña Colada (1983), Margarita (1995) and Mojito (2010) have helped carve out the Jelly Belly Cocktail Classics® collection of six cocktail flavors. The Beeroness will host a Tweet Up at 21st Amendment, 563 Second Street in San Francisco, on January 21 to introduce the new Draft Beer flavor to her beer-loving fans. For more information, visit thebeeroness.com. Jelly Belly beans contain four calories per bean and are fat free, peanut free, dairy free, gluten free, gelatin free, vegetarian and OU Kosher certified. For information, visit www.jellybelly.com. Consumers may contact Jelly Belly Consumer Affairs at (800) 522-3267, and retailers may contact Customer Service at (800) 323-9380. Connect with us on Facebook, YouTube, Pinterest and Google+.